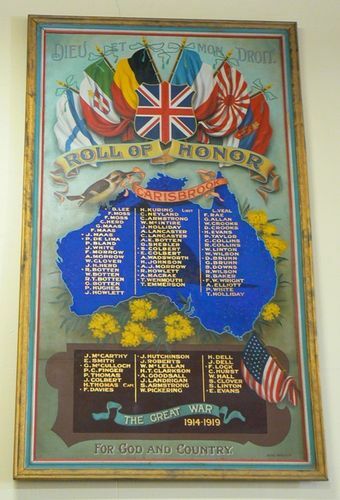 The Carisbrook Honour Roll was unveiled by Dr. Carty Salmon, MHR in 1915 and contained the names of 46 enlisted men who were born in Carisbrook or lived within a radius of two or three miles from the town . The Honour Roll was the work of Mr Berne Marcollo of Bendigo and Eaglehawk and the design of the roll contained the enlisted men's names inside a royal blue map of Australia. Additional names were added to the roll at a later date.